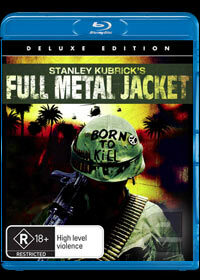 Full Metal Jacket is Stanley Kubrick's war masterpiece, set during the era of the Vietnam War and revolves around a group of soldiers who are thrown from the safety of society into the hardships of war. The story begins in "Boot Camp" as the soldiers are taught the tactics of war as their individualities are stripped and replaced by battle hardened soldiers who will not question their orders. The star of the movie is Matthew Modine as Private Joker, however the most memorable character is played by R. Lee Ermey who plays the harsh drill instructor, Gunnery Sergeant Hartman and puts his men through a variety of harsh scenarios in order to turn them into soldiers. During the second half of the movie, it moves to Vietnam as these newly formed soldiers finally face the predicament of war and features some great Kubrick moments through societal issues and the propaganda of the time. Definitely one of Kubrick's best directorial movies which pays homage to the original novel and in turn cinema itself. The Blu-Ray version of the film is quite impressive with sharp images and vibrant colours and although it was never filmed in 1080p, the transfer is almost flawless. It is also the first time that the movie is available in widescreen that is matched perfectly with the Dolby Digital 5.1 soundtrack. Although at the end of the day, the video and audio quality is superior than DVD, however when compared to modern Blu-ray discs, it is slightly lacking. Needless to say, it's still a great transfer. The bonuses included on this disc include audio commentary, the between good and evil featurette and the original theatrical trailer that although do not add anything new to the movie is still a great insight into the creation. Definitely one for fans of war or Kubrick!